It’s fountain pen day – time for another fountain pen related post. 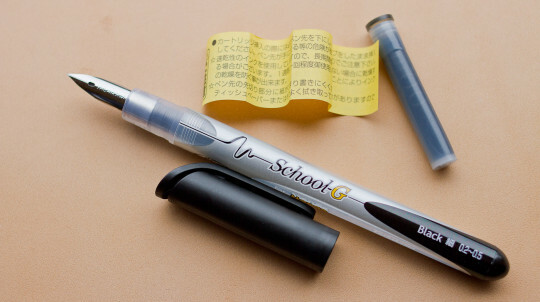 This time: the Tachikawa fountain pen, model School G for Manga. It comes with an extremely fine nib which for line widths from 0.2 mm to 0.5 mm. If you think that’s fine – Tachikawa offers an even finer nib as well as version of this pen with sepia coloured ink. Just to help avoid confusion: Tachikawa also has a reputation for making very good flexible nibs for dip pens, one of them is called the G nib, but that’s a different nib. I got my Tachikawa pen a few months ago from Fudepens, together with the Pentel Ain Click eraser I wrote about earlier this year and other products. 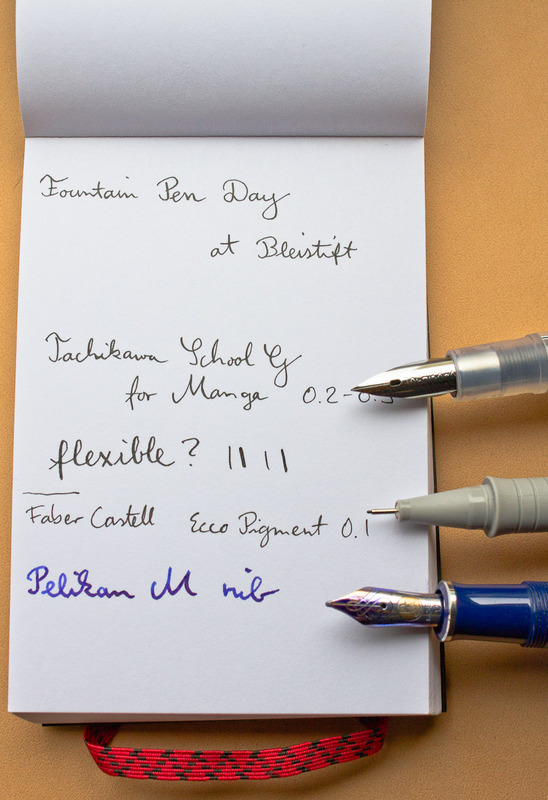 As far as I know Fudepens is only selling the 0.2-0.5 mm version, which costs €7 (~$8.70; £5.50), not the versions with other nibs or ink colours. The pen comes with a adivce on a little yellow piece of paper. One of the recommendations suggests using the pen at least once a week. The implication is the “special quick-dry ink” might otherwise clog up the feed. The ink is really black, similar to Indian ink, which is probably why it is easier to clog up the pen. As you might have expected – a fountain pen with such a fine nib is rather scratchy. As mentioned earlier the body of the pen suggests a line width of 0.2 mm to 0.5 mm, but when I writing without applying much pressure the line width is not even as wide as that I get from my Faber-Castell Ecco Pigment 0.1 mm fine liner pen. You can vary line width by applying more pressure, but you have to use quiet a bit of pressure (at least with the pen I got) to get a line of ~0.5 mm – so much pressure that you have to write slowly to control the line. An interesting fountain pen if you want a very fine line. It does produce a very clear line that is easy to see, despite being so exceptionally thin, thanks to it’s blackness. In comparison other black pens, like the Faber-Castell Ecco Pigment 0.1 mm look grey-ish, even though that is not easy to see on my photo, where I compared them on a Black n’Red Polynote A7. I would like to thank Fudepens.com for the Tachikawa School G for Manga fountain pen, which I got sent for free. I don’t think the fact that I didn’t pay for the pen influenced my opinion of this pen in any way. Oops, it is actually Fountain Pen Day, and not just one of your regular pen posts! Sorry! I’m glad you like the fountain pen posts. I really like to use fountain pens, but I try to keep the number of posts low just because there’s so much more about fountain pens in blogs and forums than about the humble pencil.